When talking about the giants of science, it is unfortunately common to focus on their most ground-breaking work. Often overlooked are the less glamorous, yet equally important, contributions to science and teaching, as well as their effort and struggles that brought them to their biggest achievements. The astrophysicist Dr. Vera Rubin is best known for her uncovering of the most compelling evidence of dark matter, but her work goes far beyond that. As we will see in today’s special bite in her memory, she dared to navigate a community hostile to women, and pioneered ideas that gave life to a whole new field of astrophysics. 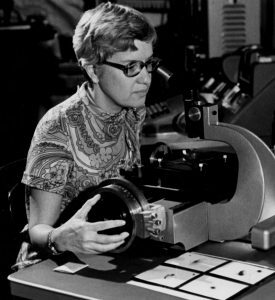 Vera Rubin using her “measuring machine” to analyze photographic plates. Courtesy of the Carnegie Institution of Washington. Vera’s earliest publication available online is an excerpt published in the Astronomical Journal in 1951 reporting the results from her Master studies at Cornell University. In this work, she looked for evidence of galactic rotation around undetected galactic centers that deviated from the recession caused by the expansion of the universe. In an interview for the American Institute of Physics (AIP) in 1989, she recalls presenting the results in a talk at the American Astronomical Society Meeting, but her submitted paper was poorly received and not published at all. Some of her results contributed, however, to the discovery of the local supercluster. Shortly after giving birth to a child, Vera was accepted for a Ph.D. program at Georgetown University, under supervision of George Gamow, who was a pioneer in applying the theory of the Big Bang to understand the formation of nuclei in the universe. For her thesis, she studied how nearby galaxies lump together, and concluded that this distribution can be simply explained by physical theory of turbulence. After completing her doctoral work, Vera lectured at Georgetown University for eleven years while raising her children. During this time, she also published a paper on solar limb darkening among others on the kinematics of stars in the Milky Way. Vera was then accepted as a staff scientist in 1965 at the Carnegie Science Department of Terrestrial Magnetism (DTM). There, she started working with Kent Ford and his brand new spectrometer in the study of quasars, but the competition for observing time drove them away from the topic. Since then, Vera spent her energies diligently observing the radial velocities of stars in the Milky Way and nearby galaxies, which eventually led to the discovery of dark matter and the Rubin-Ford effect — an observation suggesting that a sample of galaxies moves in a specific direction in relation to the cosmic microwave background. Her passion for observations is crystal clear when we read her memoirs or the stories her collaborators tell. As one of the few female astrophysicists working in academia continuously since the 1950s, it is not surprising that she encountered countless obstacles to perform her work. Vera, however, generally faced them with good humor and perseverance. One episode reported by John Bahcall happened when she went for an observing run at the Palomar Observatory. As the first woman in history to use those facilities, she had to stick a piece of paper in the shape of a skirt on the men’s restroom icon in order to have a ladies’ room. The “first woman in the observatory” dilemma was just one of the many obstacles that Vera had to navigate through. Because Princeton University did not accept women until later in the 1970s, she was rejected from that institution for her graduate studies. Episodes like these were likely the seed of Vera’s passion for women’s rights: she once refused to be in a delegation to meet the Pope because she opposed the Catholic Church’s position in birth control policies. Her moving away from the hot topic of quasars to plunge into a field that she was genuinely interested in was a daring act, and one that reflects a mindset that inspired many young scientists thereafter. In the AIP interview, she attributes the motivations for her early work to plain old curiosity, and that probably is resultant of her non-traditional background. This online document contains the testimonies of many people who she influenced in one way or another. In particular, the astrophysicist Prof. Priyamvada Natarajan recalls that she was “deeply encouraging of every young woman on the path to a career in science”. As a staff member of the DTM, “[Vera would come] to the undergraduate talks and [give] supportive feedback, always interested in talking to students and giving them encouragement,” as reported by Dr. Alicia Aarnio. Dr. Vera Rubin passed away on December 25th, 2016, at the age of 88 years. Her legacy will live on through her daughter and three sons, the collective endeavor to understand the universe and the countless scientists who she inspired throughout five decades of tireless work. Thank you for a lovely tribute to the inspirational Vera, Leonardo. I recall that, in another field of scientific endeavour, the Nobel prize is known as the No-Bell prize: so Dr Rubin is in excellent, excluded, company. It was my pleasure to write about such an awesome professional as her. Let us continue her legacy!